Freelance writer and poet from London; if you would like to read my poetry, please check out my book, 'Poems on the Page', available from goo.gl/Ta4oAX. For almost a year, David Nash worked endlessly at Kew Gardens to produce some of the most stunning wood carvings. His tireless efforts were well worth it, as his creations are now part of Kew's seamless garden landscape until the 14th April. With an axe and a chainsaw as his tools, he created beautiful installations using methods such as charring. In the spirit of sustainability, he worked with the trees grown at Kew Gardens which had already been blighted by disease or knocked down by storms. His sculptures are made out of a variety of species, such as oak, holly, and ash, creating a beautiful range of colours and textures. There are lots of areas to explore, such as the Wood Quarry, which explores the artistic possibilities of wood, and includes sculptures such as the The Ladel & Spoon and The Huddle. A visit to the Shirleywood Gallery includes carvings of a Seal, and has a display of prints painted by Nash that depict his sculptures in watercolour. Then for his crowning achievement go to the Conservatory to view the Cork Spire, a centrepiece made from sustainably grown Portuguese cork oak. Kids will also love the trip; just download the Family Nature Trail, and you can all search the garden for Nash's Two Sliced Cedars and Temperate House Sculptures. Daily walking tours are also a good way to get an informative look at the work. 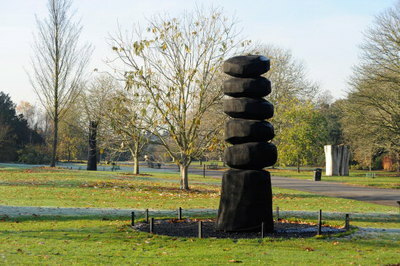 Visit David Nash is included in the price of admission, which is £14.50 for adults and £12.50 for concessions. Under 16s go free.